Why does OCMS offer a 3-day program for children age 2.9 when Montessori guidelines suggest a 5-day program? 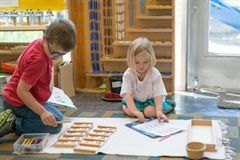 Creating consistency and routine is essential in developing strong Montessori programs. Consistency builds a feeling of empowerment and the child establishes a comfortable routine very quickly. For some families, however, a 3 day program is most suitable and we are proud to offer options to best meet the needs of our community. Why does OCMS group children in mixed age classrooms? 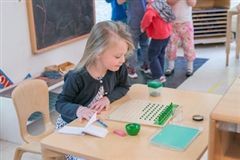 The Montessori curriculum encompasses a 3 year age span, allowing younger children to learn from older, and older children to learn from teaching the younger. In a multi-age class setting, a child can always find a peer working at his or her level. With students returning to the classroom each year, a strong sense of community is formed. Do Montessori classrooms provide structure? Montessori classrooms are highly structured at every level. Children are given the opportunity to investigate and learn about subjects interesting to them, all while following clear procedures, boundaries, and structure. As children learn things in a different order from one another, this flexibility within the structure of the classroom offers students the opportunity to learn at a pace that is both comfortable and challenging.